Two weeks before I’m due to step on a plane to do a six day detox, I receive an email. It’s from Jane, the yoga retreat’s hostess. Now if you’d shown me this a year earlier I would have winced. My sugar, dairy and gluten fuelled body could never go without her beloved chocolate, cheese, croissants and coffee. Never! You see I suffer with migraines. Yes, it’s just a bad head. But by ‘bad’ we’re talking about spawn of the devil pain that lasts for two or three days. Although I have found some relief with a neurologist’s prescription, I’m determined to find other ways of easing the pain and subsequent stress on my body. So now I find myself sitting on a plane filled with excitable holidaymakers on their way to sun, sand and sangria, while I am to be greeted by yogis, juicing and the promise of spiritual enlightenment. It’s amazing what you get yourself into isn’t it? Research has led me here, as migraine can be caused by impaired liver function, so with hope of a true cleanse and redemption from my caffeine addiction, I arrive at Malaga airport to be greeted by a driver and four well dressed but nervous looking women. As we wind our way through the beautiful Alpajarras region of Andalucia, our worries are set aside as we chat about life, families and travelling. We are greeted at the charming Kaliyoga retreat, a converted farmhouse on the side of a pine forest mountain by Lali, a serene yoga teacher who will be our detox guide for the week. Our first yoga class of the day starts at 5pm and the guided relaxation has most of the room fast asleep like babies within minutes. We then have an evening ‘meal’, a delicious vegetable broth which, after expecting to be thrown in at the juicing deep end, I am pleasantly surprised to (almost) chew my way through. Then it’s off to bed to dream about what’s to come. Each day we’ll have a morning and an evening yoga session, with the choice of relaxing massage therapy, reflexology and nutrition consultations, or just chilling out by the lovely pool. Breakfast on day one is a vibrant green juice made with apple, celery and ginger. Then it’s time for our first 'demonstration'. Yoga teacher Lali, who has the most incredible knowledge about the body, digestion and all things nutrition, introduces us all to what she reassures us will become our best friend for the week, a strange looking piece of apparatus called the Clysmatic. It turns out that we will be using this ‘equipment’ (you can Google it if you really want to know more), twice a day, every day for the rest of our stay. Lali explains that when you do a juice fast, toxins are released by your body and your liver has a hard time keeping up, especially if your gut is not eliminating properly. So we each have our own machine (and bathroom thank god), to help this process along. Although my former self would have run for the hills, the thought of a cleansed body means I’m still here. Plus even though we are all total strangers, it seems we have bonded with bemused amusement over the ridiculousness of it all. Lunch juice that day is a 'liver stimulating' beetroot, carrot and lettuce concoction. Then as a returning customer to Kaliyoga I get the blissful benefit of reflexology – a soothing foot massage that benefits the whole body, performed under a mulberry tree in the soft Spanish breeze. Utter heaven. Days 2 and 3 incorporate Yin yoga, a much gentler form of yoga as we are told that our bodies and minds will now be releasing the many toxins of daily life. They’re not kidding; We’re all having intense dreams – apparently your brain’s way of sorting out all the rubbish that’s been stored in there for months (and years in some cases). Day 4: We are all either feeling exhausted or springing about like children, as different levels of detox are happening with our new healthy diet of juice, juice and more juice. In yoga today we are told that anyone feeling light headed should lie down for a rest. With that the whole room goes down like a domino set. Day 5: I can’t believe I’m still not hungry. All the juice is giving us plenty of fuel to keep sunbathing and relaxing. I treat myself today to a consultation with Beccy, a nutritionist who explains that I must now soak any nuts and seeds I eat to help my body stay hydrated. Warm herbal teas, hot lemon water and eating soups, stews and salads should also guard against dehydration and headaches. Day 6: Departure day and we get to eat again! It’s a healthy raw salad (filled with digestion boosting enzymes) with bee pollen, a new superfood which I’m definitely buying when I get home as it’s delicious. We all say goodbye like best friends and wish each other lots of love and luck in our healthy journeys ahead. So would I return? Even though you'd never catch me juicing (and the rest) every day for a week at home, so far the migraines have eased up a little. I’m feeling relaxed and much lighter in both body and mind too, so yes I’ll definitely be back. 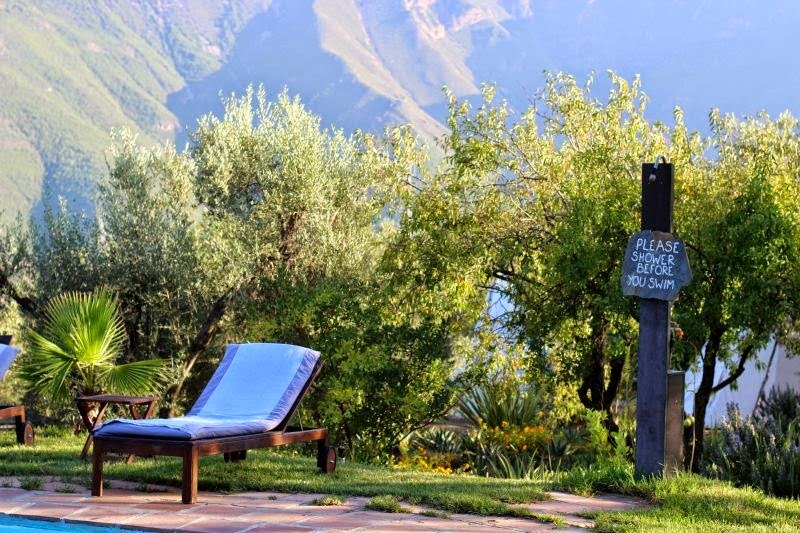 Getting there: Kaliyoga operates yoga and detox retreats in Spain, Italy and France.